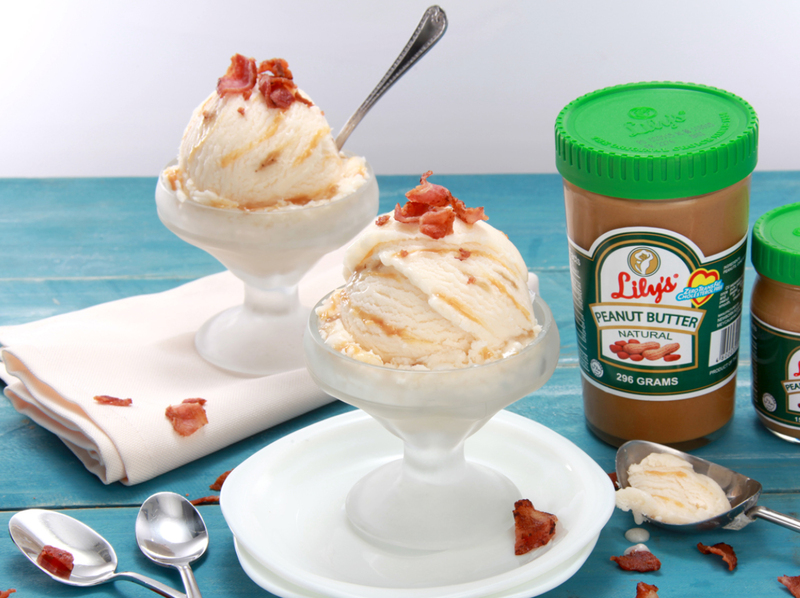 Elvis Presley was known to love the combination of peanut butter, bacon and banana. So, what better than to honor his legacy is by chowing down his favorite flavors to this ELVIS PRESLEY inspired ice cream? Give in and grab a cup of joy like the king of Rock. - In a pan, simmer water over medium heat. - Prepare an extra bowl with ice water and set aside. - In a metal bowl, whisk the egg yolk, 1/2 cup of sugar, banana puree, amaretto liquer, and salt. - Place the metal bowl over the pot of simmering water (do not let the bowl touch the water). - Whisk for 8-10 minutes until thickened. - Remove the bowl from the simmering water and put it in the bowl with ice water. - Beat the heavy cream and add the remaining 1/4 cup sugar with mixer until the cream holds stiff peaks. (Do not overbeat). - Gently pour the banana puree. - Heat Lily's Peanut Butter in the microwave for about 20 seconds until soft. - Let it cool slightly. - Swirl spoonful of Lily's Peanut Butter into the banana cream. - Serve with bacon bits on top.